Local Texas man Alex Jones, the conspiracy theorist best known for screaming about gay frogs, riding horses while shirtless, hawking lead-contaminated dietary supplements, and claiming he is in communication with President Donald Trump, has been up to something pretty suspicious himself. According to an investigation by BuzzFeed, Jones’ site InfoWars has been ripping off content from Russian state broadcaster RT since May 2014, copy-pasting at least 1,014 articles from RT’s website. 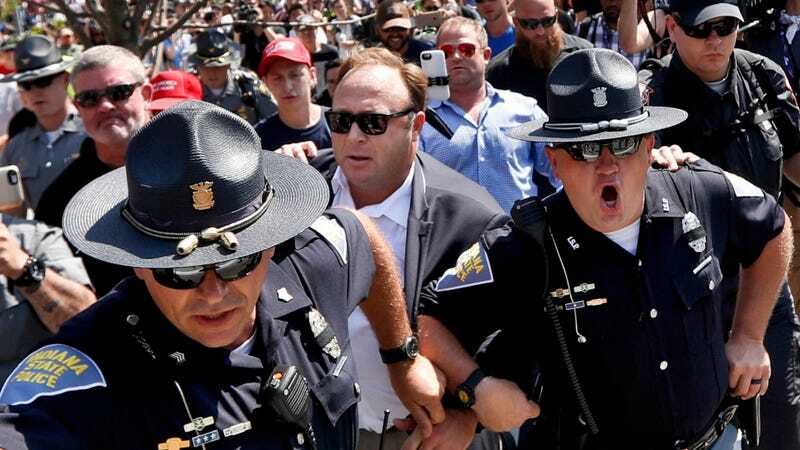 The articles were posted to InfoWars with a byline crediting them to RT, but the broadcaster told BuzzFeed they had never given Jones’ site permission to do that—and other searches of BuzzSumo data showed InfoWars had similarly reposted articles from “CNN, Sputnik, Breitbart, CNS News, the Blaze, CBC, BBC, Vice, The Guardian, The Washington Post, The New York Times, The New York Post, LA Times, BuzzFeed, and others,” according to BuzzFeed. This should probably surprise nobody, given Jones’ low journalistic standards, which have included promoting unfounded stories that top Democrats were organizing Satanic child abuse parties at a D.C. pizza place, or that mass shootings are false flag operations enacted at the behest of shadowy globalists. But as BuzzFeed noted, Jones once flew off the hook at accusations he was promoting Russian propaganda. Methinks Jones doth protest too much. The RT link may be of particular note since the broadcaster has been swept up in allegations it helped back an alleged Russian operation to flood the U.S. with propaganda and misinformation before the 2016 elections with at least a stretch goal of supporting Trump’s campaign. Jones is an enthusiastic Trump backer; Trump has appeared on Jones’ show for interviews, while Jones himself has noted his surprise at the president’s apparent fondness for his site. It’s probably for the best not to dwell overmuch on this connection, lest one end up sounding like one of Jones’ slack-jawed devotees, but it does add yet another unflattering dimension to Trump’s InfoWars leanings.